The 52 Assembly of the African Caribbean and Pacific nations (ACP) is underway in the commercial capital of Benin Cotonou from the 28 November to the 5th of December 2018. This session also marked the 36th session of the Joint Parliamentary Assembly (JPA). HE Talon Patrice ; President of the republic of Benin graced the occasion and told delegates that they should stand firm and come up with good action plans that are implementable; otherwise he said the Cotonou Agreement will result to nothing. He made this statement on Monday 5th December 2018 at the Golden Tulip hotel at the opening of the ACP-EU assembly. He called on the ACP parliamentarians to be realistic and innovative when it comes to the ACP Agreement. 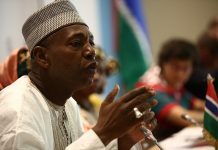 He refers to the ACP Agreement which expires in a few months’ time as a document that lacks content that gap must be addressed in post Cotonou discussions. Taking the floor was also the Speaker of the National Assembly of Benin Mr. Houn Gbedji Adrieu who said the meeting was very important as it marked that beginning of the engagement of the post Cotonou Agreement soon. He reminded the delegates that it was on the 23 of June 2000 when the Cotonou Agreement was signed here in Cotonou. He recalled that the ACP-EU did registered some achievements such as observation of elections within the region and peace negotiations as well. He informed the delegates that Benin will soon go to elections and therefore the presence of such delegates here is inspiring. He mentioned the ratification of the declaration of young people with disabilities by 161 out of 177 countries is another mile stone. Also present on the occasion was the Speaker of the National Assembly of Bukinafaso, cabinet ministers of Benin and several delegates from the 78 ACP countries and several EU countries too.